This is a collection of letters and documents written by and to Abraham Lincoln between 1843 and 1865. 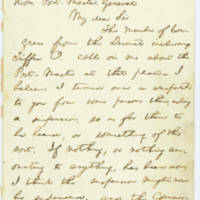 Most of the correspondence is from his Presidency and relates to the Civil War. The collection is housed at the State Historical Society of Iowa in Des Moines, Iowa. Ada Hayden spent her career at Iowa State University as a Botany Instructor (1910-1918 and then, as an Assistant Professor of Botany (1919-1950. She was named Curator of the ISU Herbarium (1947-1950). Hayden was an avid conservationist who worked to have natural prairies in the state set aside as preserves. Photographing and illustrating plants was a specialty as well. During her time at Iowa State she added more than 40,000 specimens to the herbarium. The images in this collection are lantern slides of plants found on the prairie. Adonijah Welch was the first president of Iowa State Agricultural College. He served as college president from 1869 to 1883 before resigning. From 1885 until his death in 1889, Welch served as a psychology professor at Iowa State. This collection includes his addresses and papers during his time at Iowa State University. Contributor: The African American Historical Museum and Cultural Center of Iowa and University of Iowa Libraries, Iowa Women's Archives. Historian Darlene Clark Hine said: "There is an urgent need to discover and collect more primary source materials pertaining to the lives and experiences of ordinary middle western Black women in both rural and urban communities." Although Hine and her colleagues centered their efforts on African-American women in Illinois, Indiana, and Michigan -- states which traditionally have had more sizable black populations than Iowa -- the history of African-American women in this state is no less important. Indeed, Iowa's African women share a collective history that is both precious and powerful but all too seldom explored. --Kathryn M. Neal, from Giving Our History a Home: The African-American Women in Iowa Project.